Definition : A system in which the controlling action or input is somehow dependent on the output or changes in output is called closed loop system.To have dependence of input on the output, such system uses the feedback property. Feedback : Feedback is a property of the system by which it permits the output to be compared with the reference input to generate the error signal based on which the appropriate controlling action can be decided. In such system, output or part of the output is feedback to the input for comparison with the reference input applied to it. Closed loop system can be represented as shown in the Fig.1. It is not possible in all the systems that available signal can be applied as input to the system. Depending upon nature of the controller and plant it is required to reduce it or amplify it or to change its nature i.e. making it discrete from continuous type of signal etc. This changed input as per requirement is called reference input which is to be generated by using reference transducer. The main excitation to the system is called its command input which is then applied to the reference transducer to generate reference input. Practically many electronic integrated circuits work on the d.c. voltage range of 5 to 10 V. The supply available is 230 V a.c. Hence the reference input voltage in the range of 5 to 10 V d.c. is obtained from the command input 230 V z.c. and proper rectifying unit. The part of output, which is to be decided by feedback element is fed back to the reference input . The signal which is output of feedback element is called 'feedback signal' b(t). When feedback sign is positive, systems are called positive feedback systems and if it is negative systems are called negative feedback systems. This error signal is then modified by controller and decides the proportional manipulated signal for the process to be controlled. This manipulation is such that error will approach zero. This signal then actuates the actual system and produces an output. As output is controlled one, hence called controlled output c(t). 1) Accuracy of such system is always very high because controller modifies and manipulates the actuating signal such that error in the system will be zero. 2) Such system senses environmental changes, as well as internal disturbance and accordingly modifies the error. 3) In such system, there is reduced effect of nonlinearities and distortions.4)Bandwidth of such system i.e. operating frequency zone for such system is very high. 1) Such systems are complicated and time consuming from design point of view and hence costlier. 2) Due to feedback, system tries to correct the error from time. Tendency to overcorrect the error may cause oscillations without bound in the system. Hence system has to be designed taking into consideration problems of instability due to feedback. The stability problems are sever and must be taken care of while designing the system. The best example is human being. If a person wants to reach for a book on the table, closed loop system can be represented as in the Fig.2. 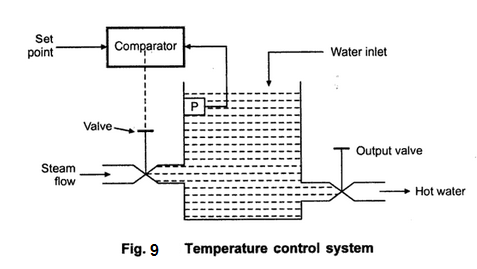 In this system, the heating system is operated by a valve. The actual temperature is sensed by a thermal sensor and compared with the desired temperature. The different between the two, actuates the valve mechanism to change the temperature as per the requirement. In this system a roll sensor is used as a feedback element. The desired roll position is selected as θr while actual roll position is θc, which is compared with θr to generate controlling signal. 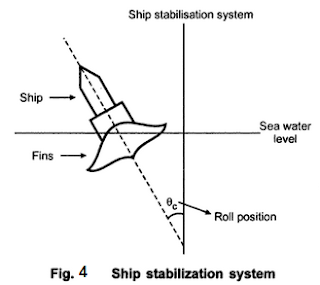 This activates fin actuator in proper way to stabilize the ship. A locomotive operator driving a train is a good example of a manual speed control system. The objective is to maintain the speed equal to the speed limits set. The entire system is shown in the block diagram in the Fig.6. The D.C. shunt motor is used where field current is kept constant and armature voltage is changed to obtain the desired speed. The feedback is taken by speed tachometer. 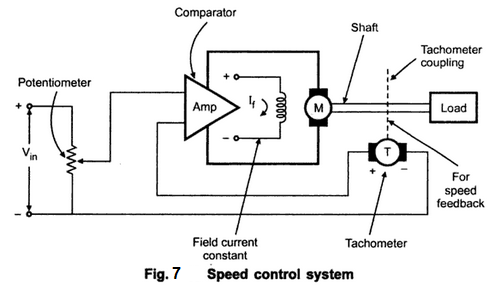 This generates voltage proportional to speed which is compared with voltage required to the desired speed. This difference is used to change the input to controller which cumulatively changes the speed of the motor as required. The aim is to maintain hot water temperature constant. Water is coming constant flow rate. Steam is coming from a valve. Pressure thermometer 'P' is used as a feedback element which sends a signal for comparison with the set point. This error actuates the valve which controls the rate of flow of steam, eventually controlling the temperature of the water. This is sophisticated example of military application of feedback control. The enemy plane is sighted by a radar which continuously tracks the path of the aeroplane. The launch computer calculates the firing angle interms of launch command, which when amplified drives the launcher. 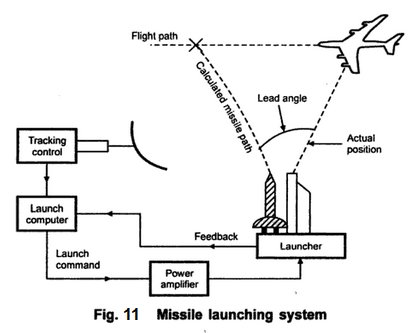 The launcher angular position is the feedback the launch computer and the missile is triggered when error between the command signal and missile firing angle becomes zero. The system is shown in the Fig.11. Supply voltage required for various single phase appliance must be constant and high fluctuations are generally not permitted. 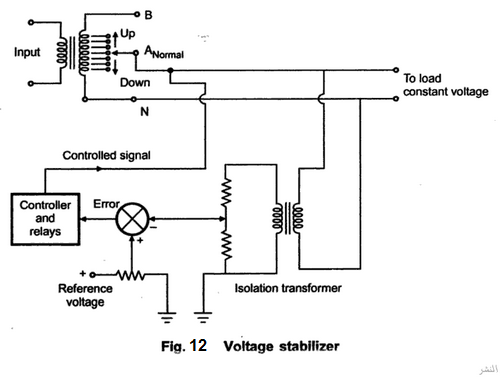 Voltage stabilizer is a device which accepts variable voltage and outputs a fixed voltage. Principle of such stabilizer is based on controlling number of secondary turns as per requirement to increase or decrease the output voltage. 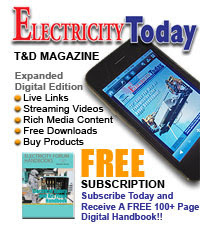 The actual output voltage is sensed by a transformer and potential divider arrangement. 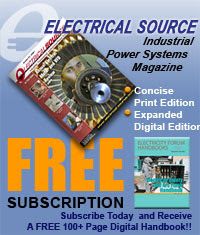 The reference voltage is selected proportional to the desired output level. The actual output is compared with this to generate error which in turn is inputted to the controller. The controller takes the proper decision to increase or decrease the number of turns so as to adjust the output voltage. The scheme is shown in the Fig.12. The other examples of closed loop system are machine tool position control, positioning of radio and optical telescopes, auto pilots for aircrafsts, inertial guidance system, automatic electric iron, railway reservation status display, sunseeker solar system, water level controllers, temperature control system. So in closed loop feedback control systems cause and effect relationship between input and output exists.